Thoughts from a Stone was actually the first ever teaser released for the Coma Cluster Void experiment, all the way back in 2014. Back then, I suppose it was going to end up on their upcoming full-length, with the slogan “Aural Representation of Pain and Suffering” – Mind Cemeteries –, but the composition probably expanded or reiterated to what it is now: a twenty-two-minute, six-part suite of contemporary death metal. Contemporary? Yeah, I feel that this adjective better suits their sound than the rather narrow definition of “tech-death” or the vague “experimental” and “avant-garde” tags. 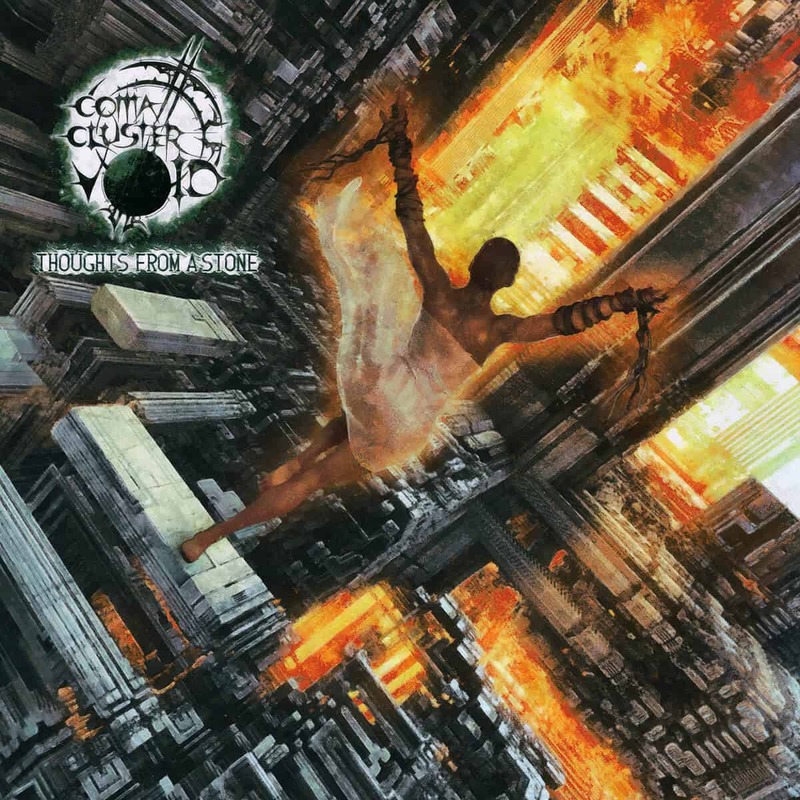 “Math metal” is a good contender, in that regard, but it doesn’t fully grasp the scope of what Coma Cluster Void stands for. Beyond the numbers dictating the time signature, they also, and perhaps more importantly, work to push forward the harmonic possibilities of metal, thanks to the unique tuning pattern of John Strieder’s ten-string guitar, and Sylvia Hinz’s five-string bass. Contemporary metal is, thus, a direct parallel to contemporary classical music, where new boundaries are created. Thoughts from a Stone is a praise-worthy successor to the band’s debut album, and expands many ideas that were expressed there further. For example, what I like to call the “chromatic neighbourhood” – many consecutive chromatic notes – in chords and scales. Its traditional use is to bridge the perfect fourth and fifth with a tritone, especially in blues, but it can sound very unsettling when using it around the tonal centre and with more than three neighbouring notes. John’s peculiar tuning allows such chords to be easily played, and it’s such a treat to listen as well. One thing that differs from Mind Cemeteries is just how much the bass guitar is present, now. That was once of my complaints with the debut album: the bass was almost totally absent. They rectify the case, much to my delight. In the end, Thoughts from a Stone is a step in the right direction for Coma Cluster Void, proving they’re not short of ideas. Be sure to get your hands on this one, it releases on October thirteenth.